Such a reorganization of workplaces, coupled with the institutionalization of democratic codetermination, would effectively end capitalism. It would mark yet another milestone in human history, following the earlier transitions out of slavery and feudalism as organizations of production. The disappearances of slaves and masters and lords and serfs would now be replicated by the disappearance of capitalists and workers. Such oppositional categories would no longer apply to the relationships of production. Instead, workers would become their own collective bosses. The two categories—employer and employee—would be integrated within the same individuals. “Criminals” are another rogue actor blamed for capitalism’s cycles. The mass media and appropriate authorities routinely denounce those illegally gaming the system: the underpaid secretary who embezzles, the insider trader who makes illegal profits, the syndicates that run whole industries or cities. Such illegal economic activities happen all the time, even more so during crises. Criminal activities are thus more effects than causes of capitalism’s cycles. Yet historical and contemporary records overflow with blame variously heaped on the illegal acts of financiers, corporate executives, corrupt state officials, union leaders, and “organized crime” for causing capitalism’s cycles and crises. Whether consciously or not, such a focus on misbehavior by the state or by criminals serves to avoid blaming the system and its rules and regulations, its structure of rewards and penalties. Pinpointing “the bad guys” perpetuates the ancient art of scapegoating, deflecting blame on convenient targets when in fact the system is the problem. Indeed, some capitalists come to internalize the system’s rules and imperatives. They define themselves and mold their personalities in conformity with the behaviors imposed on them as capitalists. So it may seem and be said—even by capitalists themselves—that they are greedy or have other character flaws. However, when capitalists, for example, try to squeeze more work out of employees while trying to pay them less, replace workers with machines, relocate production to low-wage areas, risk their workers’ health with cheap but toxic inputs, and so on—those are behaviors prompted in them by the realities of the system within which they work and for which they are rewarded and praised. Many capitalists do these things without being greedy or evil. When capitalists do display greed or other character flaws, those flaws are less causes than results of a system that requires certain actions by capitalists who want to survive and prosper. [...] the board of a WSDE would likely see the need to secure certain management functions. It might, like its capitalist counterparts, hire professional managers. On the other hand, it might prefer instead, for many reasons, to substitute a rotational system whereby all surplus-producing workers are periodically rotated through management positions. The board might see this as an appropriate way to avoid reifying people into fixed positions of manager and managed—positions that might possibly pave the way for a return to capitalism. Workers who were thus temporarily removed from producing surpluses would nonetheless need to be funded for their management activities and time by the board’s distributions from the surplus it appropriates from the nonmanagerial workers. The extent to which worker-directors are also rotated through management functions would further differentiate a WSDE-based economy from capitalism. [...] the WSDE-based system would not need a patent system (nor suffer its constraint on other people’s use of new inventions), since it could provide alternative incentives for innovation just as it established alternative sources of needed funding. We are now ready to tackle a particularly thorny issue in the analysis of an economic system based on WSDEs. This concerns the division of the employees of every WSDE into two groups with different relationships to the production and distribution of the surplus. The first group comprises the workers who produce surpluses and who also compose the board of directors in WSDEs. They are the workers who directly produce the outputs of the WSDEs—the software programs, shirts, buses, machines, and so on. Every WSDE also employs another, different kind of worker who provides the conditions and ancillary services that enable the surplus-producers to function. I will call these workers enablers. Enablers include the secretaries, clerks, receptionists, security guards, cleaning staff, and so on who maintain the paperwork and physical spaces that provide the necessary conditions for the first group of workers to produce a surplus. Other types of enablers include managers, lawyers, architects, and counselors who provide still other conditions. Enablers are just as crucial for the reproduction of the WSDE as are the surplus-producers. However, unlike the surplus-producing workers, enablers do not directly produce the surplus; rather, they provide various conditions for the surplus-producers to function effectively. The enabling group of workers obtains its sustenance and the means to perform its functions by receiving distributed shares of the surplus from the worker-directors. In other words, the surplus-producers need the enablers to be able to produce surpluses, while the enablers need surplus distributions from the surplus-producers/appropriators to be able to perform their enabling functions. A WSDE-based economic system could thus address the ancient problems of the division of labor and specialization of function. Adam Smith’s pin factory has often been interpreted as a rationalization for ever-more-narrow specialization of jobs, training, and mentalities as necessary for maximizing surpluses and profits. For most of those interpretations, specialization of a function has been treated as identical to specialization of the functionary. Yet that is not the case. Whatever the merits of specialization of function within a division of labor, the merits of equivalently specializing the laborer are dubious. Beyond a certain degree and a certain period of time, keeping one person in one job may reduce productivity and profitability. 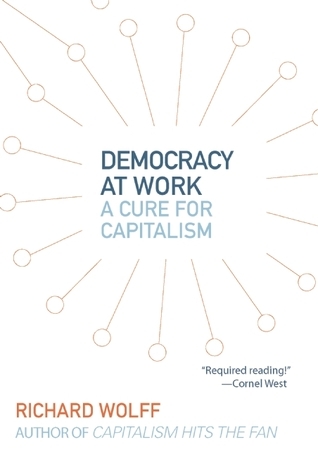 If a fully rounded personality and a diversely engaged body and mind are connected to personal happiness, genuine democracy, and work productivity, then a WSDE-based economic system with rotation of jobs will be far more fulfilling—and quite possibly more productive—than work has been under private or state capitalism. Yet workers in most modern capitalist corporations are required by law and/or custom to accept working conditions over which they exercise no democratic control. If they refuse, they can be fired—and the primary option available to them is to work for another employer under similarly undemocratic conditions. For most workers in capitalist systems, there is no democracy in the workplaces where they must spend most of their lives. [...] The left has always existed in tension between two basic dimensions. On the one hand, the left needs and desires to be concrete and practical, to have its feet on the ground, with direct responses to people’s immediate needs and solutions for today’s problems. On the other hand, it needs to have and project its utopian dimensions. Those include its visions for what could solve not only today’s problems, but rather the underlying structural conditions that keep regenerating them. Utopian dimensions also include a clear vision of an alternative set of structural conditions that people believe might work and are therefore worth fighting for as an alternative to a deteriorating status quo. Capitalism has generated its own organic intellectuals. In the United States and elsewhere, academic departments of economics have worked to train them at both undergraduate and graduate levels. Undergraduate courses focus chiefly on capitalism’s extraordinary excellence in allocating scarce resources among competing demands and generating income distributions that justly reward all contributors to production. Graduate economics programs elevate such utopian claims into formalized models that claim to show how and why capitalism yields a general optimally efficient equilibrium that maximizes the welfare of all market participants. The organic intellectuals of the WSDE movement can present both practical possibilities (as in section 10.1 above) and utopian visions of a socialism that is far more democratic than the standard examples from the twentieth century. By doing so, they may be able to persuade the Occupy movement and the millions it has engaged that WSDEs belong on the agenda for social change. The program for increased WSDEs needs to support and build—in universities, labor unions, social movements, and beyond—the meetings, discussions, courses, and centers that can generate and train organic intellectuals.